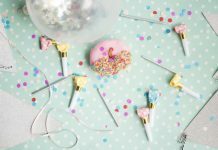 Home Ideas 3 Wedding Themes, Choose The Suitable One! 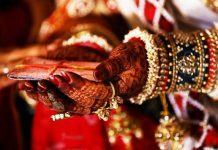 A wedding is a symbol of two couple bond in a holy promise. 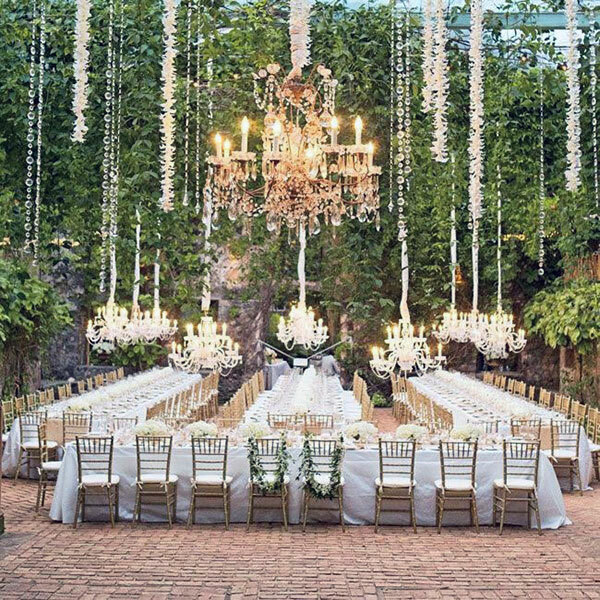 Planning a wedding could be a hard thing to do as we have to choose the theme wisely. Despite, whatever theme you choose it should contain a meaning why you choose it and fit your budget. 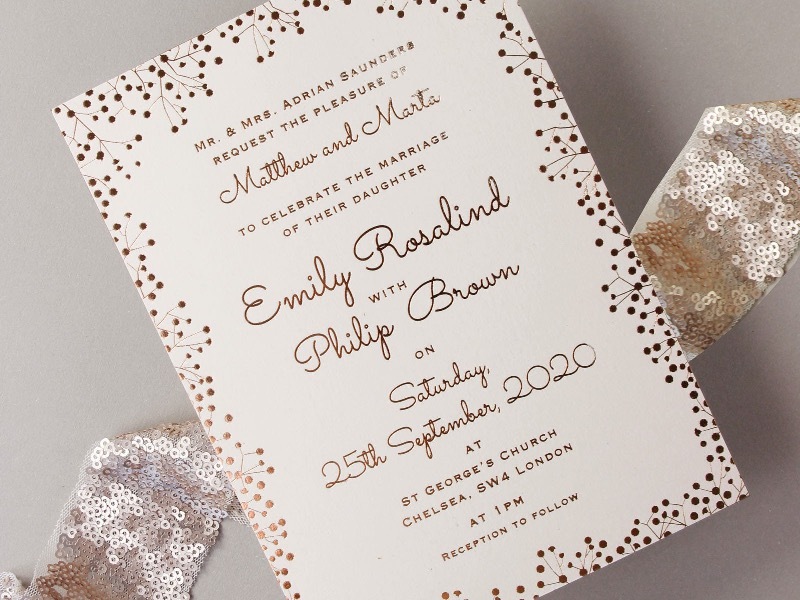 Today, we are going to show you 3 wedding themes that will be surprising for you. 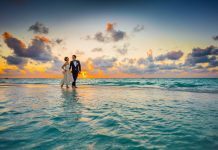 Fairy Tale concept is the most popular which every woman dream about. This concept just like a fantasy movie where there are a prince and princess whom uniting their love in a marriage. 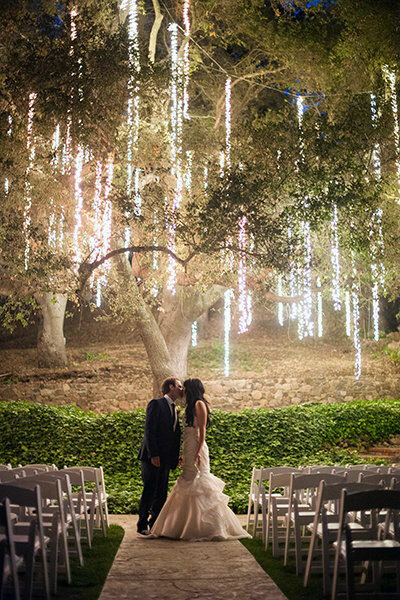 Now, we are going to show you some perfect aspects that you should know of this wedding theme. We will show the masterpiece design comes from the dress, wedding cake, invitation card, dining place, bridesmaid dress, and the wedding ring. This wedding dress looks so beautiful. Certainly, it will melt everyone who sees it. 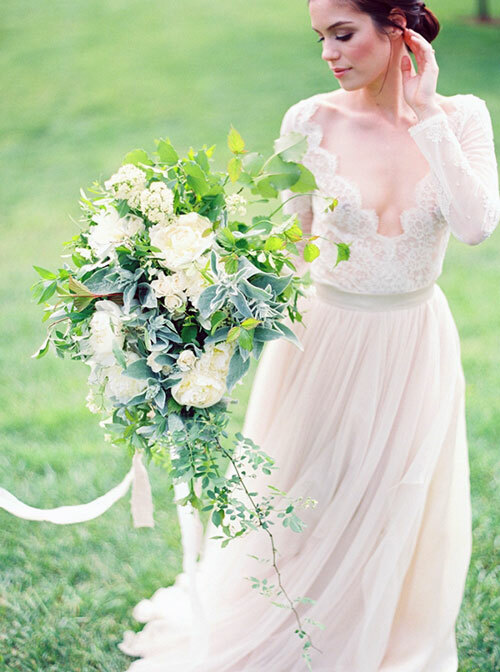 This dress would be suitable if you hold your wedding event outside as it would be suitable to the environment. 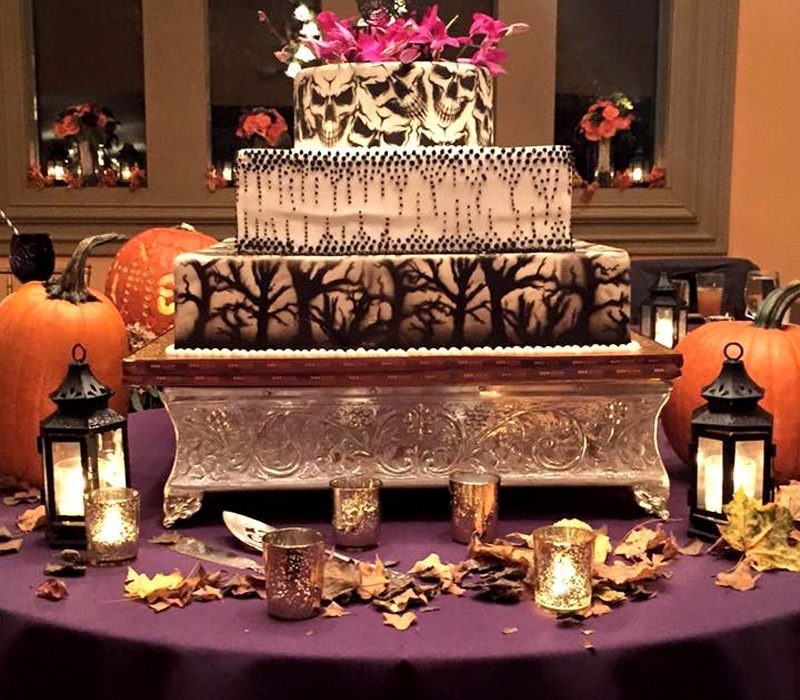 Take a peek on the cake above. It looks like a castle where it has a meaning that their love will be protected just like how the castle is protected. But there is a shortage about this where you need to spend lots of money to make such as this cake. The concept just like the castle roof but it looks so elegant. The color choice and also invitation cover really match each other. Really a smart choice! 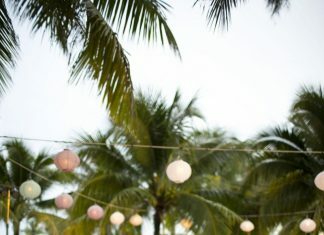 Are you planning to conduct your wedding event outside? You might choose this design where the dining place takes outside of the building. Your guest would feel comfortable as they would enjoy the fresh air with the outstanding dish! 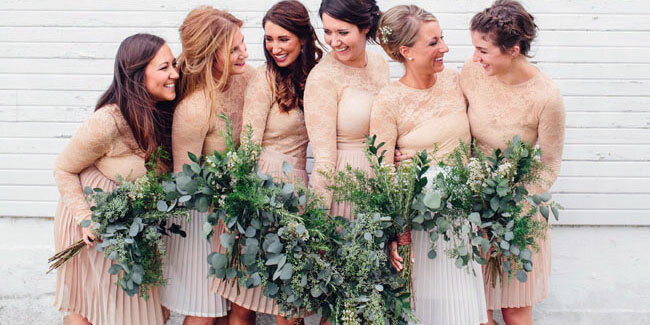 Have no idea about choosing your bridesmaid dress? The concept above could be as your reference as it does not cost lots of money but it looks so beautiful. 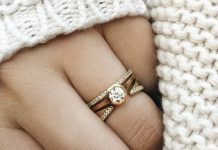 The last one which really engaging to your wedding is your wedding ring where it should match to your theme and this one really fits Fairy Tale wedding theme. The ring decoration and diamonds look so elegant. Here is the second theme that we are going to discuss. It is called as Emerald and Gold wedding theme because it combines between emerald and gold color which look elegant. If you are looking for elegance. This concept really meets your need. 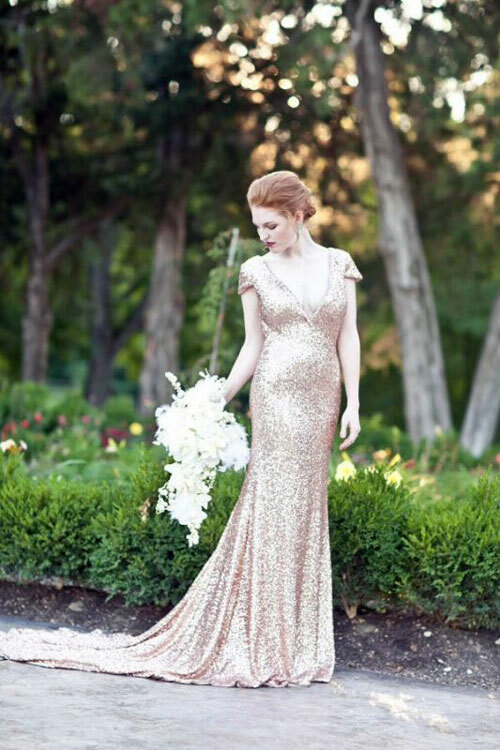 The gold color is the basis of the wedding dress above but combining with the Emerald concept. It looks sparkling on the eyes. This dress is suitable if you would like to hold either at indoor or outdoor. 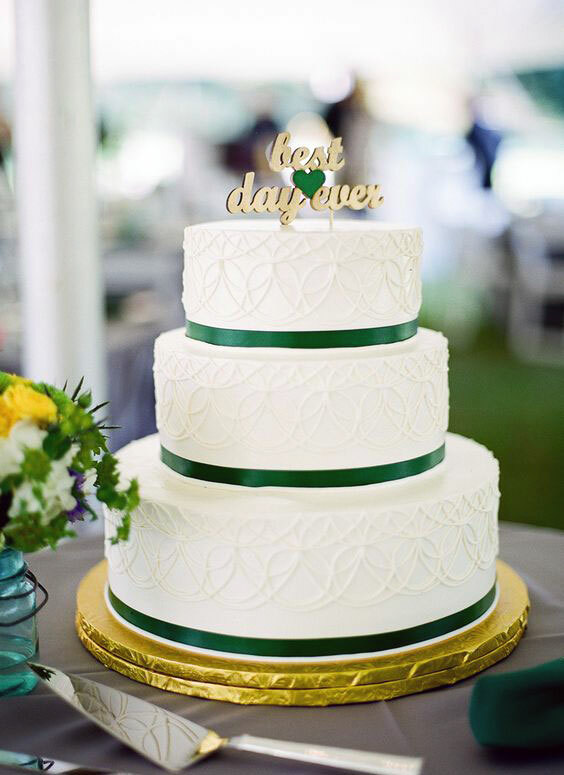 The motif really matches to the cake color and the cake base really beautifies the concept of Emerald and Gold. Thumbs up for the great selection! 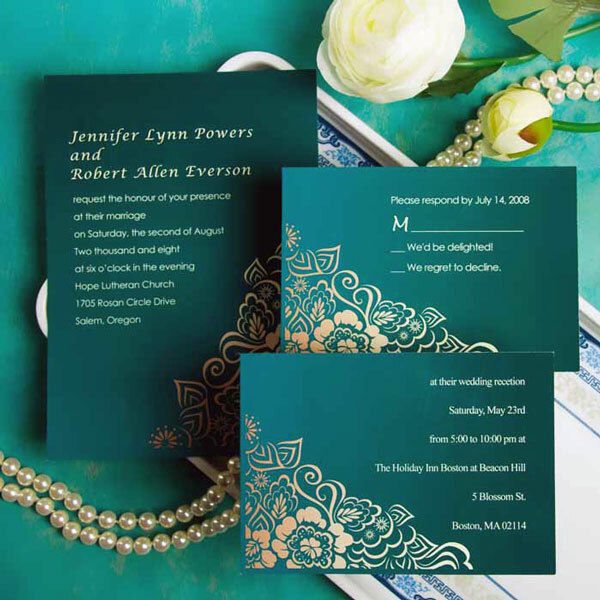 The invitation card uses emerald color combined with gold color as the decoration. Then, the flowers decoration on the invitation corner adds an aesthetic value. Discussing the dining place. This one absolutely creates a great atmosphere for your guests. 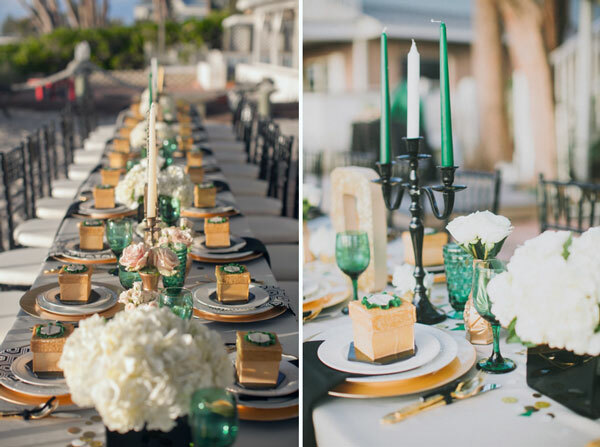 The glass color & plate choice encourage the Gold and Emerald theme. You can use this design as a reference if you would like to plan an outside dining place. Bridesmaid usually use the same wedding dress in every wedding event. Meanwhile, in the design above show the difference as the bridesmaid dress mixed into Emerald and Gold color to boots the theme. 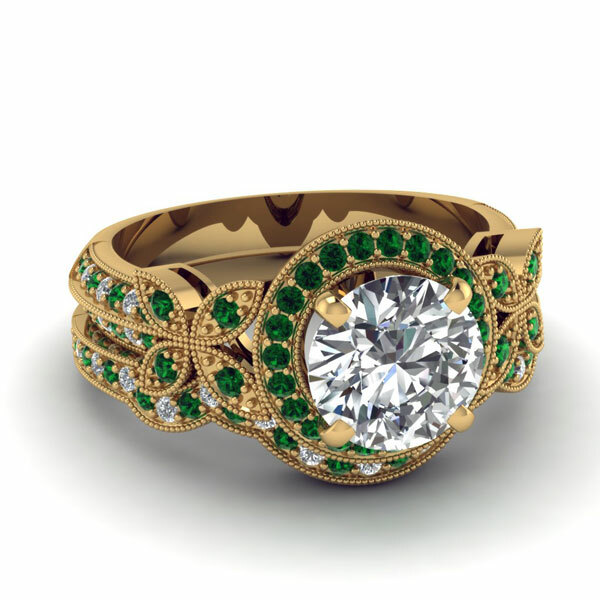 This one is the masterpiece of all Emerald and Gold rings. 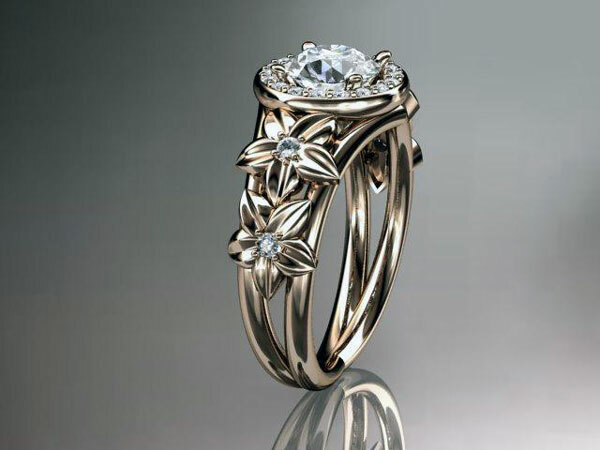 The diamonds selection, edge decoration, and color choice exactly melt everyone who sees it. However, the cost for this one is really expensive as it uses 24-carat diamonds with emerald as the edge decoration. Here is the last theme where we will explain. 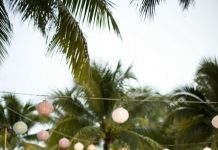 Greenery wedding mostly use by many people because it has a unique sense and also low budget cost. Besides that, it can be held anywhere as long as the place is filled with trees. 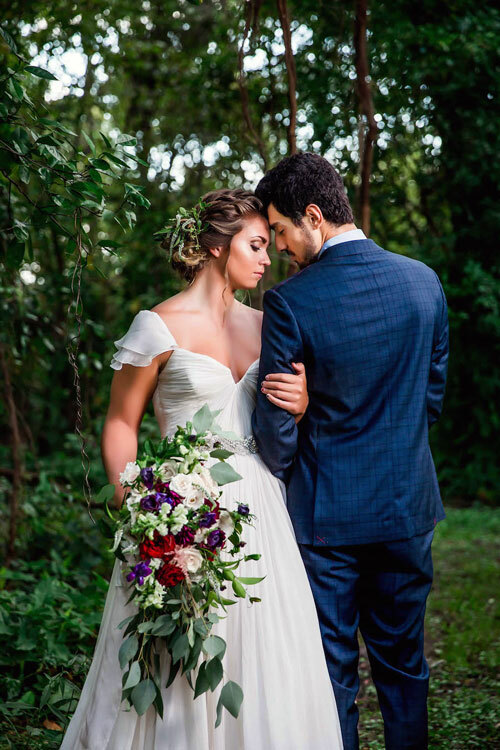 The dress and also the bouquet really match each other. You can use this design as it looks simple and low cost. 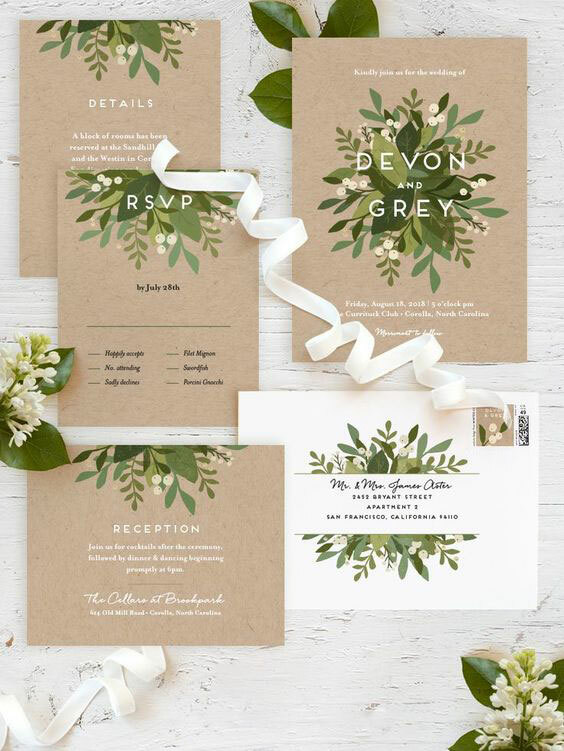 Really suitable for everyone who wants to hold greenery wedding theme. This one is quite unique. 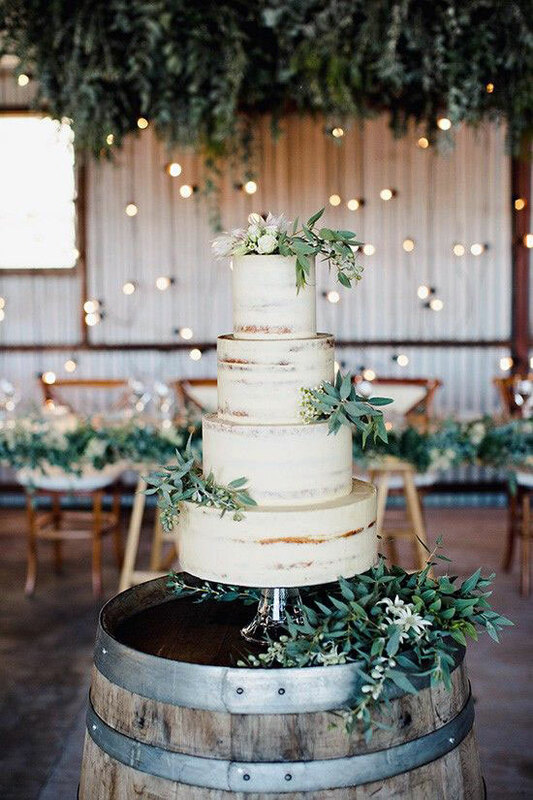 If you find in other greenery wedding theme that the cake is placed on the wooden table or tree table but this one is totally different where it is placed on a barrel. 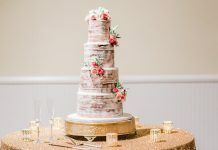 The cake is also simple to made and will not spend your money a lot. 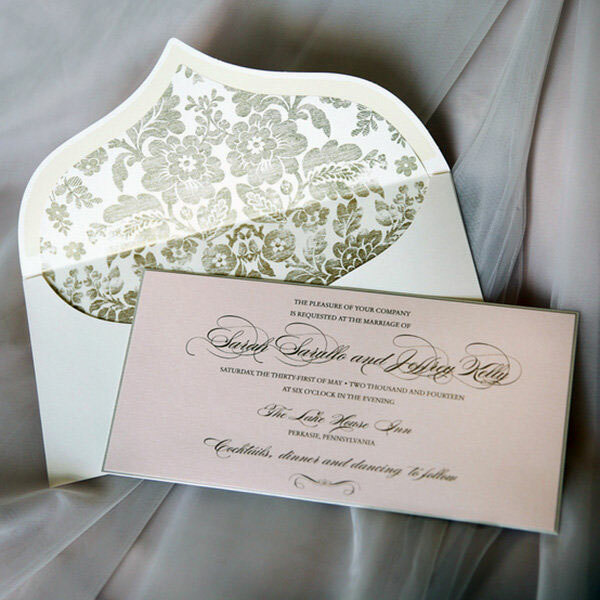 Simple and beautiful wedding invitation card, even it still looks great without any cover. It is easy to made and almost on every printing services they can make it as they use a basic art paper where you can find it anywhere. What do you feel if you are there? Actually, this place is a green house but it changed into a wedding dining place. Your guest can enjoy your dish while they also enjoying the nature view. We are giving this design because it matches to any greenery wedding theme and it also takes a low budget to make. This design is simple, meaningful and also elegance. 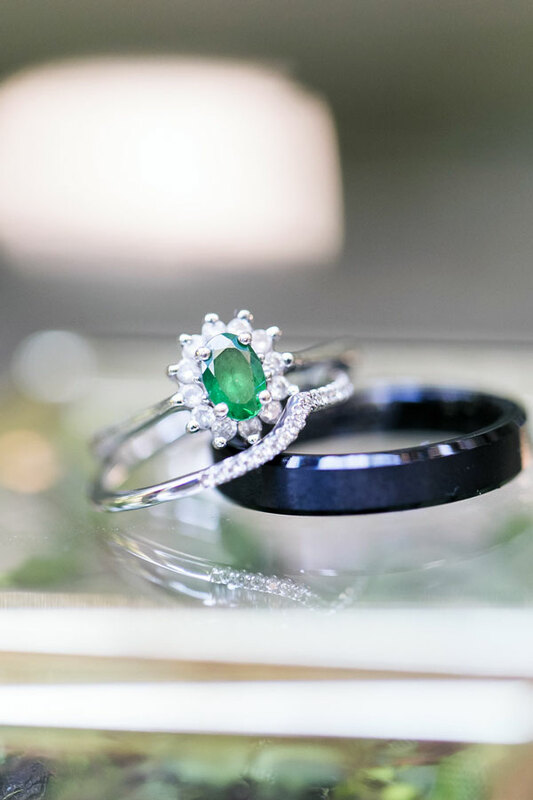 Simple wedding ring with a small emerald decorating it. It will not spend lots of money on your pocket. 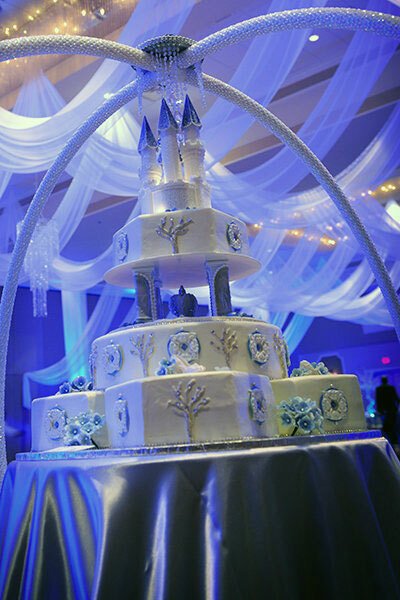 We have talked 3 wedding theme consist of Fairy Tale Wedding, Emerald and Gold Wedding and Greenery Wedding Theme. 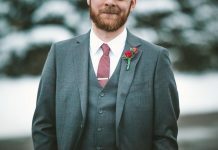 Hope you can find which one is suitable for you or maybe for your couple if you are currently planning a wedding for her. Choose it wisely based on your budget. Fairy Tale and Emerald and Gold use lots of budgets to hold. 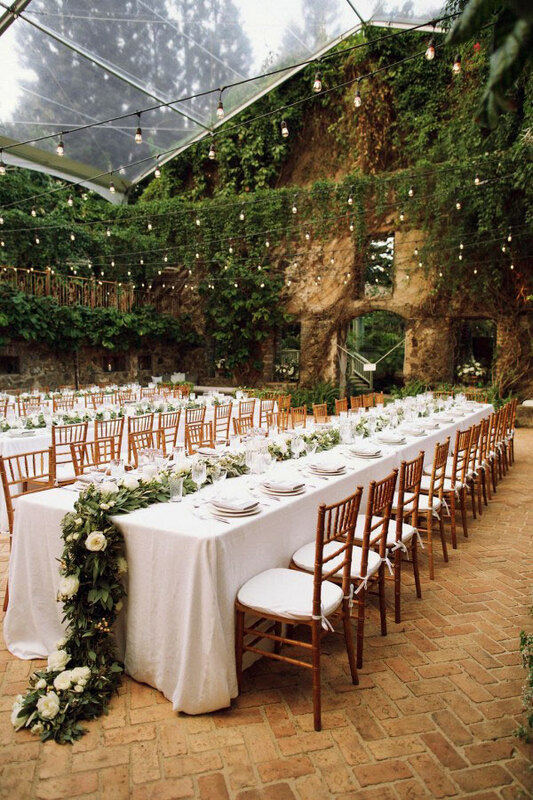 However, if you are on low-budget you can choose greenery wedding theme which can be held else where.